Ostia Antica is an ancient Roman harbor city on the Tiber River. Due to silting and a drop in sea level, Ostia is now located several kilometers inland from the shoreline. The name of the city derives from the Latin “ostium” meaning mouth and referring to its long ago position at the mouth of the Tiber River. In the second and third centuries AD, Ostia was a vibrant city that contained many insulae (large apartment buildings) that functioned much like our modern mixed-used (retail on the ground floor and 2-4 stories of apartments above) structures. One of the best preserved is the Caseggiato di Diana (House of Diana). Scattered throughout Ostia there are mosaic and marble floors, usually associated with the numerous bath complexes found in the ancient city. Exploring the streets and remains of homes, warehouses, baths, and businesses –some still surprisingly intact – is the ultimate in snooping around. Turning a corner and stumbling onto an incredible mosaic floor off the main tourist paths is something quite special. 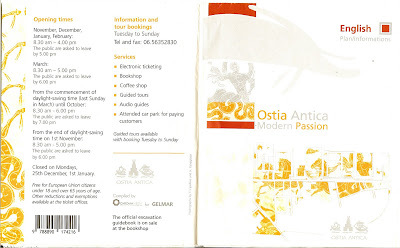 Ostia is spacious (estimates vary, but 170+ acres), so there is plenty of to see; be prepared to wander around and soak up the ambience. In the early, sunny November days we visited in 2010, the ground was carpeted in green. Every step we took seemed to produce fragrant whiffs of mint and other herbs. 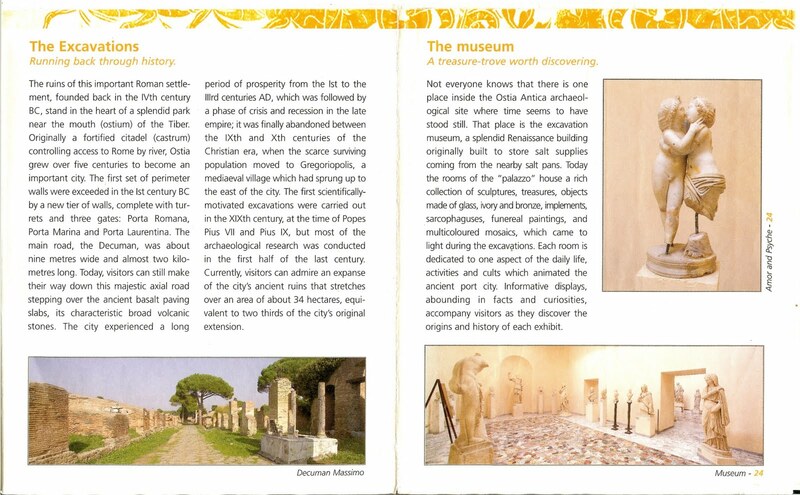 Visiting Ostia Antica could easily take two days. We had heard great reviews about it and had originally planned to spend one full day there. After the first day we decided that it was worth spending more time there and so we spent a second day there on our way down to Naples. Both days at Ostia we ate a late lunch at the café inside the archaeological complex and were happy with the price and choice of food. The café is located near the museum which is worth a visit. 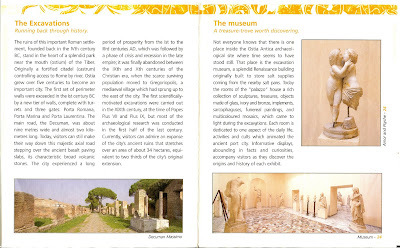 Finally, before visiting Ostia it helps to read up on Ostia and Roman history. Two resources that we liked are the Ostia-Antica.org web site and the video The Roman Way of Life and Death at Ostia, the Port of Rome part of a series of Yale courses online. 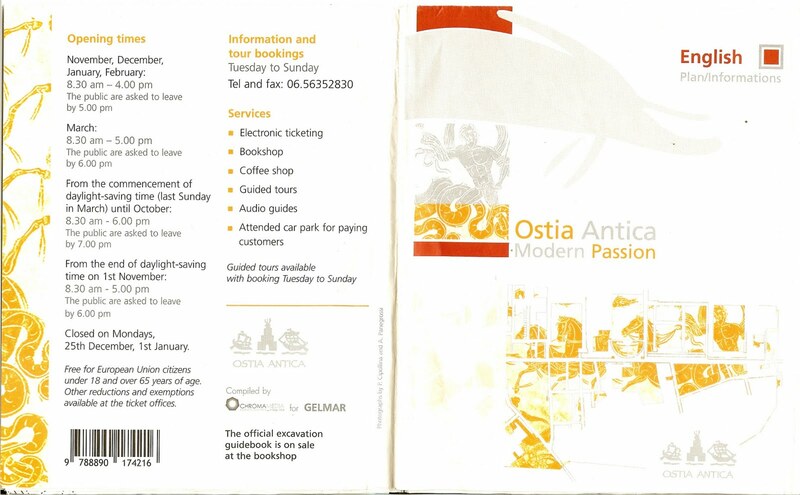 The Ostia-Antica.org web site has a travel guide and lots of other resources about Ostia including links to movies. The captions for some photos here refer back to the Ostia-Antica.org site. For views of different mosaic and marble floors of Ostia, see this entry.